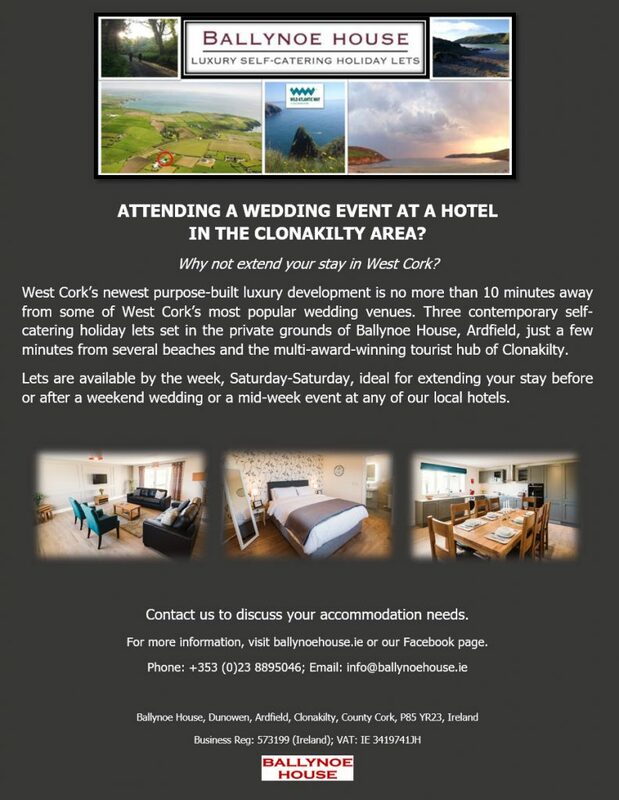 Why not extend your stay in West Cork? Ballynoe House, West Cork’s newest purpose-built luxury development, is no more than 10 minutes away from some of West Cork’s most popular wedding venues. Three contemporary self-catering holiday lets set in the private grounds of Ballynoe House, Ardfield, just a few minutes from several beaches and the multi-award-winning tourist hub of Clonakilty. Lets are available by the week, Saturday-Saturday, ideal for extending your stay before or after a weekend wedding or surrounding a mid-week event at any of our local hotels. Pricing is all-inclusive, a fixed weekly rate based on full occupancy from €35 per person per night until the end of 2018, and €36 from 2019. Contact us to discuss your accommodation needs.